Ectomycorrhizae, which are more frequent in tree roots, and which significantly modify their branching. 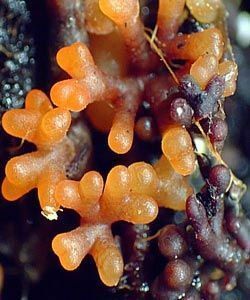 More than 2,900 species of vascular plants form ectomycorrhizae. 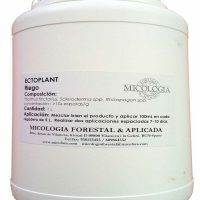 95% of ectomycorrhizal species (pine, fir, Douglas fir, larch), 94% of fagaceae (beech, holm oak, hazelnut, chestnut, etc.) are 90% Of the mirtáceas (eucalyptus) 83% of salicáceas (willows, poplars …) 70% of the betuláceas (birches) many ulmaceae (maples), juglandáceas (walnuts) cistáceas (rock roses, Cistus and Helianthemum …) In other words, ectomycorrhizas form practically all trees (95%) and many shrubs of interest in the temperate forests of the Northern Hemisphere, including the Mediterranean ones. 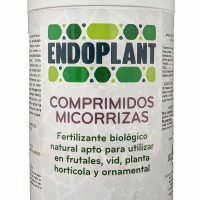 Endomycorhizae, usually in shrubs and herbaceous plants that do not modify the external appearance of the root, although its internal morphology. Plants that basically form endomycorrhizas: leguminous (apiaceous), rosacea, oleaceous, euphorbiaceous, scrophulariaceae. Rubiaceous, cyperaceae, grasses (poaceae) and composite (fabaceae). That is, most of the crops, fruit trees and plants for gardening, as well as the natural herbaceous stratum of many ecosystems of the planet are endomicorrícicos. 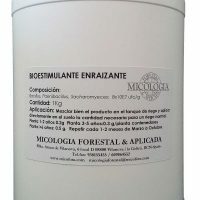 The physiology of the mycorrhizal plant changes completely when it is associated with the fungus. 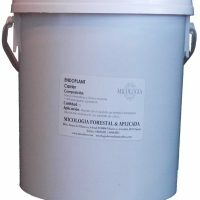 By means of the external mycelium, the contact between the roots and the medium increases considerably. One centimeter of roots without mycorrhizae explores 1-2 cm3 of soil; With mycorrhiza increases 5-200 times. Usually the volume of soil is 12-15cm3 colonized by the inoculum of mycorrhizae (exceptionally it has reached 200 cm3). 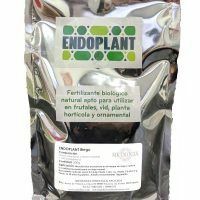 By increasing the volume of soil explored by mycorrhizae, the efficiency of soil nutrient uptake increases. 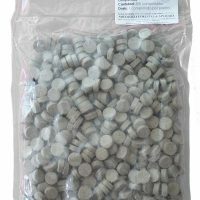 Mycorrhizae extract phosphorus from the available pool but indirectly affect the solubilization and mineralization processes. There are other effects produced by mycorrhizae, such as increased mycorrhizal plant resistance to water stress and salinity, increased resistance and / or tolerance to certain soil pathogens, increased transplant survival and an increase of nitrogen fixation in legumes. In conclusion, it can be argued that the benefits of early inoculation with mycorrhizal fungi have a reduction in fertilizer and phytosanitary inputs, a reduction in water supply, higher growth and production of mycorrhizal plants, conditions of stress and a better use of the soils.